Welcome back to the illustrated dungeon! 31 square dungeon themed tiles with hand-drawn elements with doors and scenery counters. Suitable for use with 25/28/30mm figures (1in = 5ft). -Scenery counters, including pillars, fallen rocks, gold, bodies, chests, tables and more. -Wall blocking pieces – for covering unwanted exits on the tiles. Compatible with other Inked Adventures products. 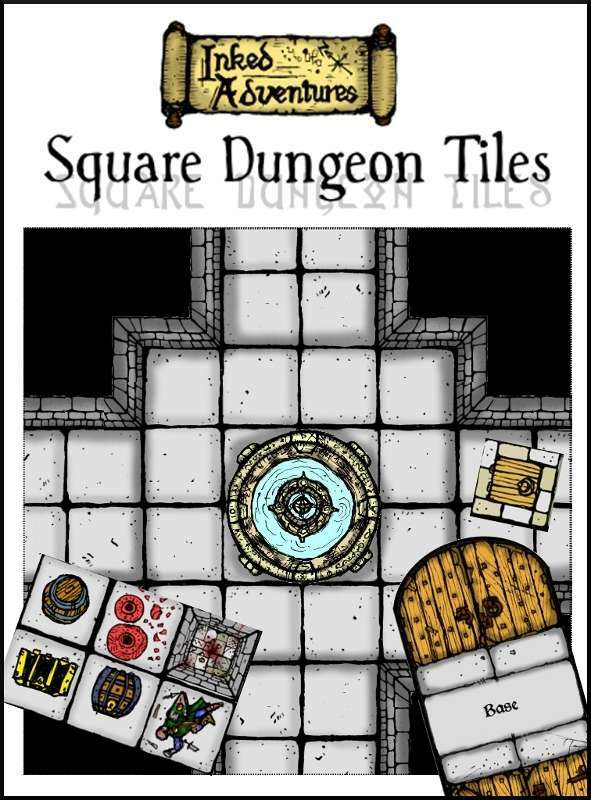 This product was created in response to numerous requests by gamers who wanted the Inked Adventures style art in a square geomorphic tile format. We hope that this pack lives up to those expectations! Welcome back to the illustrated dungeon! May you tabletop games be beautiful! Each tile and scenery pieces have been assembled on a computer using many hand-drawn elements. However, due to the nature of this process, some details are repeated, and there may be some inaccuracies in joins and dimensions -which can occur when scanned ink lines are used in printed products. There is a rugged charm in hand-drawn grids which can be hard to replicate on a PC. Where possible we have erred towards aesthetic over exactitude. 40 pages of dungeon corridors, rooms, doors and much more. Check out our full range for expansions and free downloads. This title was added to our catalog on July 14, 2012.